"Bob Diven is a literal one-man show. In fact, the evidence shows that he is capable of writing the show, performing the lead role himself, composing the score and then doing both vocals and instrumentals, designing and building sets (complete with original paintings on the walls), creating the costumes, and then turning out posters and playbills to publicize the production." S. Derrickson Moore, Las Cruces Sun News, 10 May, 2003. 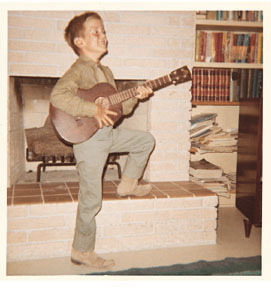 I had the pose -- just needed to learn to play the thing. I may have been the last one to realize that I was a performer. As I sift through old photos I find a surprising number of me dressed up in costumes of either my own assembly or, later on, of my own making: a Santa suit, army uniforms, cardboard armor, a blue sport coat converted into a civil war tunic. I pestered my brothers and played around with their instruments: drums, guitar and trombone. I had a sense of the theatrical: I remember a Christmas party where Carol Porter led the adults in singing "The Little Drummer Boy" -- I just knew that a bit of drumming from down the hall would add that mystical, magical element, and rushed to set up my brother's snare drum. My impulse was right, but my execution was not: the song was about over by the time I was ready, and I wasn't a very good drummer at that young age. Of course everything I had in terms of talent was raw and young. It took me a long time to find any confidence, which came with a gradually dawning awareness that I was, indeed, "talented". That term, along with comments on my "potential", became an odd burden to a kid who enjoyed the un-earned attention it brought him. But it took a long time to figure out that undeveloped talent was so much flash with no substance -- I may have craved the flash, but I hungered for the substance. So I played trumpet in the school band program, and sang in church and school choir and acted in plays. I decided that I was a good "group" singer, but no soloist. So I was surprised to find out later in my life that I did, indeed, have the desire to be out front and, often, on my own. But first I had to be sure that I was good enough. My youthful attempts at creative expression had given me a deep need to be more action than talk. I had come into this life with a lot of talent -- so much that it took a very, very long time both to understand its nature and to grow into it all. I'm happy -- ever so happy to report that I am now quite at peace with my talent and the abilities that time, effort and experience have forged from their raw materials. Like the overnight sensation that took twenty-five years to happen, my work now comes easily to me, and I can simply get on with the business of doing what I do.